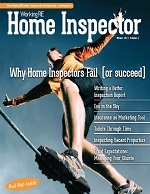 Editor’s Note: Home Inspectors no longer have to pay more for the complete coverage they need. A new program from OREP includes most coverages in the minimum premium ($1,250), including errors and omissions and general liability insurance. OREP (Organization of Real Estate Professionals) is proud to announce a new insurance program that allows inspectors to have complete coverage and save money! David Brauner Insurance Services/OREP has been servicing the insurance needs of home inspectors for 12 years. Includes Errors and Omissions (E&O) and General Liability as well as most incidental coverages, such as termite, radon, and commercial coverage. “A” Rated, Admitted Carrier (except HI, LA, NY), Prior Acts, Additional Insured for Agents and other Referring Parties. This new Home Inspector E&O program includes most coverages in the minimum premium, including Bodily Injury/Property Damage (BIPD) or Premises coverage for when you are onsite at the inspection. “Home inspectors who are paying extra for ‘add on’ coverages, or worse, going without the full coverage they need to save money, don’t need to any longer. Broad coverage is included in the minimum premium, including E&O and premises coverage,” said David Brauner, Senior Broker at OREP. OREP’s new program also includes most incidental coverages, such as termite, radon, and commercial coverage. The Minimum Insurance Premium is $1,250, which provides a Coverage Limit of $300,000 Aggregate/$100,000 each Occurrence for E&O/GL. Choice of coverage limits and deductibles are available. Easy Financing. Find details at OREP.org (click home inspectors). Or call toll free (888) 347-5273. Info@orep.org.